As a boy growing up in the Midwest, I remember a lot of early morning fishing trips with my Dad. When I was a boy, the “why” of what we were doing was missing when we were rolling out of bed at 3 or 4 AM to get to our fishing spot. Why so early? Why are we fishing here and not over there? Why here at the dam in March when we fished at the lake during the fall? Why are we using this live bait or that lure or jig? The answers came slowly, over time, as a talkative little boy on the bank full of questions is pretty much the antithesis of productive fishing - one of the first lessons! But over time, my Dad answered those questions and more. Better yet, he set me up with some basic knowledge of where different fish like to feed, why, and when. He also taught me how best to catch them at different times of the year. This was especially true of one of the favorite, large, and more populous game fish where I grew up - the Walleye! This article won’t give you all the Walleye fishing tips that are out there - not even all of my Dad’s and will be found elsewhere as should be true for good information! The point of this article is to give you the some basic fishing tips and knowledge of the Walleye that will greatly improve your chances of landing some fish the next time you go out! What Bait and Tackle Should I Use? crossbreed with sauger and blue pike and this tends to support and extend breeding populations. Two keys to finding where to drop your line on Walleyes are their feeding habits and habitat requirements. Juvenile and adult Walleye generally eat other fish and this is a primary indicator of where you will find them. In classic Walleye lake environments, yellow perch and similar forage fish account for a large part of their diet along with mayfly larvae and crayfish. If these type of smaller prey fish are not available, populations will decline and cannibalism will become a problem. Do your research - see where their prey are plenty and you’ll be on the track to finding Walleye! Walleye also like to feed in the morning and at dusk, in lower light conditions (thanks, Dad!). Many attribute this feeding as an aversion to light, but in reality it is because their eyesight has evolved for slightly turbid environments in lakes and rivers. Because of this they have an advantage over their prey in these light conditions and have evolved to hunt in these conditions. Dissolved oxygen is a key component of where to find particular fish as they can be sensitive to changes in water conditions such as dissolved oxygen, pH, and temperature. Walleye need a dissolved oxygen (DO) content greater than 3 parts per million (ppm) at the least and prefer environments with DO higher than 5 ppm and a pH between 6.0 and 9.0 standard units (SU). For Walleye, their DO requirement means that they like to be in deeper, cool waters and will come into shallower areas when and if they are shady. Lower water temperatures mean higher dissolved oxygen content and shade makes the water cooler and the DO higher. Shallow sunny water is warmer with less DO. As such, you will see concentrations of Walleye in shade under bridges and similar areas. At certain times, this means they will also seek out areas of fresh, cool, flowing water. Adults often are found in areas with slight currents, except during the winter when they tend to avoid areas of turbulent water. Walleye can live in diverse environments, but large populations are usually found in medium to large lakes (> 100 ha) or river systems. Both habitats are characterized by cool temperatures, shallow to moderate depths, wide areas of aquatic vegetation around the edges of the lake, and slightly to moderately turbid water. Walleye also like extensive areas of clean rocky bottoms, and relatively open water with little siltation. 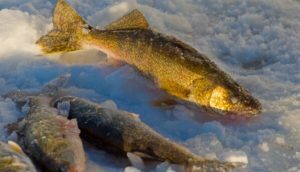 As a general guide, adult walleye generally are found under cover in moderately shallow (less than 50 feet) waters during the day and move inshore in the morning and at night to feed. In general, across all habitats and times, Walleye will respond to floating jigs with fluorescent, yellow, or white-tipped colored twister tails. When using a fishing jigs, use a line with a 6 to 10 pound test. If you are using crankbaits for baitcasting, go with a little heavier line with a ten to twelve-pound test. 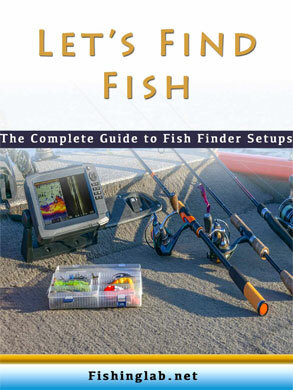 However, as pointed out below, for best results you will vary your bait according to the time of year and location. ● General Pro Tip for Walleye - If you don’t have a boat, target Walleye in the spring and fish from shore at dawn and dusk. The best time of year to fish for Walleye is right before summer, in late April and May. The most popular fishing approach is from shore or wading into the shallows of the lake or river. Small boats are also used on lakes or rivers. However, due to where the Walleye will be feeding, the shore of the lake and river are the place to be in the morning, before, and after daybreak, and at dusk. The best approach at this time of year is to drift or troll off large points of land or sand bars or submerged structure/vegetation. This is also a good time to try bays or shallow flats with aquatic vegetation or stump fields. The best bait for this time of year would be to tip a mayfly rig with a piece of nitecrawler. You can also use nitecrawler pieces on crawler harnesses or shad-like crankbaits in the same way. One trick is to put your line in off the end of bars and jig “blade” baits when fishing in May. ● Pro Tips For May Fishing Period - For best results, wait until mid-May when the gizzard shad hatch starts. You should then fish slow along the bottom where the Walleye are feeding on the shad. When selecting crankbaits, try suspending models this time of year. While not as good at the near summer period, Walleye fishing from March to April and Mid-September to November can be productive if you fish in the right spots using the right bait. For the March to April period you should fish below dams in tail waters, off the faces of dams in stocked lakes, and in causeway openings with water current present. This especially applies to stocked reservoirs with spillways. Spots to fish also include large bars or points in lakes, especially ones with gravel or rip-rap present on their tops. This is a perfect time to use jigs tipped with twisters and minnows. In the Fall and late Fall shallow water will begin to cool and dissolved oxygen content will go up. As this happens, Walleye will move back into these shallow, near shore waters. When this happens, with timing variable based on the geographic location as the seasonal changes occur, you can fish the same areas you fished in late April to May. As you get later in the year, in the Fall, the Walleye will seek deeper water off of points of land in the lake. This is a good time to cast Rat-L-Trap style lures, diving crankbaits, the jigs with minnows, and vertical jig blade bits off bars and points. ● Pro Tip for the Shoulder Periods - Walleye will be laying in open water to feed on gizzard shad. This feeding begins in late May and is variable. For best results, try trolling small gizzard shad imitating crankbaits (Wee Warts and small Shad Raps) near the surface. The Summer, when time is more available and the sun is out for longer periods, is unfortunately not the best time for Walleye fishing. As the lake heats up and season turnover begins, the waters in the lake will stratify. This will cause a thermocline to develop with a layer of warm water over top of cooler water with a mixing zone in between. As the water heats up, and lake turnover increases, dissolved oxygen content decreases. Because of the turnover, you won’t find fish below the thermocline. This is because organic material from plants or animals sinks to the bottom and decomposition ties up all of the available dissolved oxygen. As previously discussed, different species of fish require different levels of DO to survive and will seek out areas where they are comfortable. So what conventional wisdom has told you for years about casting into deep waters in the summer turns out to be the worst thing you could do! 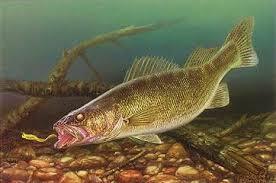 In this period, Walleye will be closer to dams and suspended in the mid-depth waters above 45 to 50 feet deep. You can set up to fish most of the same types of fish holding structures as pre summer (May) period. During the summer, trolling or casting larger crankbaits (3”-6”) and using crawler harnesses and jigs tipped with worms brings the best results. If you are determined to catch some Walleye from December to February, then you should try open waters below dams in reservoirs and on shallow bars at twilight. The best bait for ice fishing, either in channels or through the ice, would be jigs or jigging spoons tipped with minnows. In open water you should cast suspending minnow crankbaits at night in waters less than ten-feet deep. Many more tips on Walleye fishing are out there and you should always pay attention to the conditions in your own area. By knowing something about your fish, where it is, when it is feeding, what it is eating and the best time to put your bait in the water, you will increase your chances of bringing home that huge Walleye you want. Using these tips you’ll be able to land Walleye throughout the year.